Prey® is a first-person sci-fi action game from Arkane Studios, creators of the award-winning Dishonored® series. In Prey®, you are the first human enhanced with alien powers aboard the Talos I space station . Improvise and innovate as you fight your way through the alien infested station in your search for the truth. Prey® is a bold new story set in a dangerous universe. This first person sci-fi shooter from Bethesda has all the elements of the System Shock games, with a touch of Alien Isolation and dabble of Dishonored. 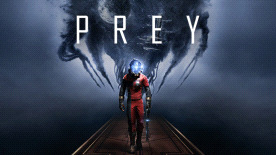 After playing through the first hour of the game, I was gripped by the immersive story and the impending sense of dread that Prey teased out of me as I wandered fearfully around Talos 1. Taking on the role of Morgan Yu, you’re quickly swept into a story of deceit, secrets and an enemy that is wonderfully clever and instantly difficult to fight against. The Prey story is emitted to us through smart interactions and glorious in game technology, which had me guessing and reassessing my thoughts of the space station that I wake to find myself stranded on. Without giving too much away, Prey will lull you into a false sense of security and quickly destroy your illusions that Morgan Yu has so defiantly resisted. The weaponry and special skills that you enquire along the way take me back to the Bioshock plasmids and the importance of switching between power abilities and your weapon set. I can’t wait to jump back into the role of Morgan Yu in May and unearth the deadly secrets of Talos 1 and the TranStar Corporation.